This was a Student Project of mine, it is a very basic instruments that could do most of the tasks on a test bench. 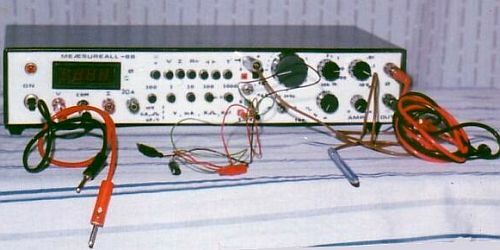 The cabinet used, was available as a part of a Hi-Fi DIY System, The Range and Mode switches were Modular Stackable Interlocked MultiPole Switches. The rest of the Interface were wirewound pots, jacks, sockets and plugs. The front panel was Engraved Acrylic, the panel was the toughest issue we tackled. The above belong to an instrument Measureall shown below.